Island Peak climbing also famous for Imja Tse (6,189m) in Sagarmatha National Park is one of the central climbing peaks in Everest Region with a remarkable and decidedly glaciated West Face that ascends from the Lhotse Glacier. The mountain was named “Island Peak” in 1952 AD by Eric Shipton’s group due to its striking location in the middle of the Chhukung valley. It seems as if it’s the Island on a sea of ice from Dingboche. The peak was renamed as Imja Tse peak in 1983. It is an extension of the ridge that comes down from the south end of the Lhotse Shar, situated hardly 10 kilometers away from the Mount Everest. This Island peak climbing offers an excellent opportunity to climb a Himalayan Island Summit together with an exhilarating Trek to the Everest Base Camp and Kala Pattar. The magnificent views from the summit are indeed a fitting reward for your efforts. 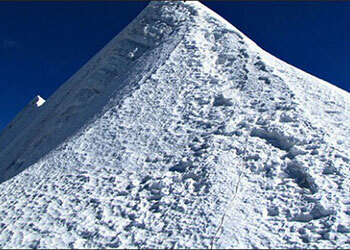 Island peak climbing is considered physically challenging; however, it is not technically challenging. Climbing of Island peak adventure gives you the opportunity to behold the never-seen-before locations ranging from mountains, glaciers, backpacking and famous mountain trails. The Island peak climbing offers you enough opportunity to enjoy the fantastic view of Mt. Everest including several other similar peaks and explore the Buddhists monasteries and shrines along with extraordinary wildlife. Path via Gokyo RI, Chukkung RI, and Kalapathar is more essential for the classic views of icefalls and glaciers of Mahalangur Himalayan range. Imja Tse/Island not only provides an enjoyable climb but also offers some of the different spectacular scenery of Himalayas in the Khumbu region including the Mt. Everest 8848m, Mt. Nuptse 7,855m, Lhotse 8,516m, Makalu (8475m) in the east, Baruntse 7720m, and Mt. Amadablam 6856m in the south, adding more charm for climbing Island Peak. We pass through other villages like Khumbu, Khunde, and Khumjung. 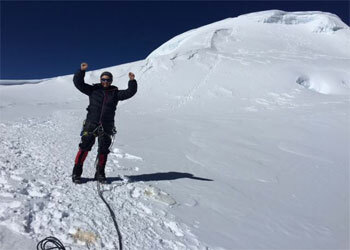 This island peak climbing expedition offers terrific trekking through the great Khumbu region and any fit, enthusiast person is welcome to join the team. Sensational views of array of high snow-capped mountains, dramatic landscapes, verdant steep valleys, Buddhist culture, warm, friendly hospitality of Highlanders, pristine lakes, breathtaking viewpoints, in the heart of world’s heritage ‘Sagarmatha National Park’ are the critical features of Island Peak climbing that will be your once in a life experience. Best time: March to May and September – November are the best seasons. Guide: Government certified hiking/Trekking & Climbing Guide. Lodging: Twin sharing tea house/guest house accommodation private room. Tented camping will be done in the journey during the trek and climbing. The very next morning, after breakfast you will be taken for a full day sightseeing tour around Kathmandu valley. You will visit center of pilgrimage Pashupatinath Temple and Swyambhunath, very ancient and enlisted in UNESCO World Heritage sites. The biggest Buddhist Stupa at Boudhnath and the fine arts and historical architecture of Kathmandu Durbar Square takes you to the ancient Nepalese culture. On journey back to hotel, you can explore the local areas, gullies and lifestyle. Early morning we flight from Kathmandu to Lukla via mountain flight of about 40 minutes scenic flight. With clear weather we get fantastic views of the mountains, including Everest as we enter deep gorge of the Dudh Kosi valley. You begin your trek from Lukla following a gentle climb up the mountainside on the left bank of the Dudh Koshi River. Along the way you will have a view of Mt Nupla (5885m), Kusum Kangaru (6367m) and the Mount Kwongde Range. We then take an easy walk for about two hours to Phakding village for the overnight stop and rest of the time stroll around the village for local knowledge. From Phakding the trail follows the Dudh Koshi valley north, meandering through the pines, crossing it twice by small suspension bridges before reaching the village of Monjo the entrance gate of the Sagarmatha National Park. Beginning with a slight climb to Jhorsalle, the trail passes waterfalls and other culturally and naturally occurring items of interest. Villages are interspersed with magnificent forests of Rhododendron, Magnolia and fir. Along the way to you will be rewarded with your first glimpse of Kusum Kangru (6369m) Thamserku (6608m), Everest (8848m) and Nuptse (7879 m). A steep climb up to the beautiful village of Namche bazaar (3440m) will afford you further spectacular views and a comfortable place to spend the second night of the trek. Set in a natural amphitheatre looking across to the jagged ridge of Kongdi Ri(6187m), Namche Bazzar is one of the most attractive settlements in the khumbu region. It is an ideal place to spend a rest day for acclimatization at a high altitude before heading off. We will have a full day rest so that we won’t face any problem ahead. Today we make a short acclimatization trek up to Khumjung, a delightful Sherpa village above Namche. You have full day leisure for wonderful panoramic view or stroll around the market You can also enjoy the splendid views of Everest, Ama Dablam, Thamserku, Nuptse, Lhotse, Tawche, and Kwangde and so on. Our trek follows on the gradual trail continues overlooking magnificent view of the great Himalaya. Along the way we can enjoy wild lives like pheasant, musk deer, or a herd of Himalayan Thar. The trail goes gradually down up to Khumjung. The trail descends slightly towards the Sanasa and then ascends up to Mongla (4000m) from where glimpses of Ama Dablam, Thamserku, Tawoche and Mt. Khumbila are awesome. Sherpa regard Mt. 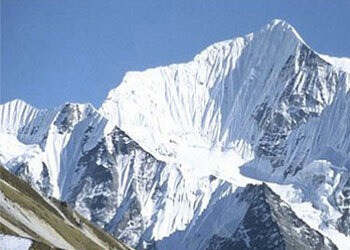 Khumbila (5761m) as sacred mountain of the patron god of the Khumbu area. Descending to Dudhkosi Khola (3250 m), we cross a bridge and again trek up passing the rhododendron forest, a host for Himalayan wild deer and musk deer. We arrive at Phorse Thanga which is just under the snow dusted peaks of Tawoche and Cholaste. It can be best place for our camping. The trail climbs steeply to Dole, through rhododendron and birch forest festooned with hanging mosses and lichens. On our way wild lives like pheasants, mountain goats and the mysterious musk deer are amazing. Offering us good views of Cho Oyu, Kantega, and Thamserku, the trail takes us through many summer settlements and a charming hamlet of Luza (4360 m). We will work across a rocky terrain scattered with a few dwarf rhododendrons also where small and thorny bushes give way to scrub juniper as the altitude increases. The Dudh Koshi valley feels deep like a canyon with its sheer sides. Walking along the hill side above thundering Dudkoshi passing through some small hamlets and through sandy spurs, we reach Machhermo. The beautiful stream flowing down from the Kyajo RI and Phari Lapche mountains runs through the middle of village before draining into the Dudh Koshi. Most probably we will be here by our lunch. Today, we climb through a ridge Chorten from where we can see remarkable view of both down the valley and of the Mt. Kangtega, Thamserku, and northern part to the Cho-Oyu (8153m). Beyond the ridge the valley widens as the trail passes through a Chorten and reaches Pangka (4480 m) after some gentle walk. After crossing an iron bridge over an stream the trial levels out as it follows the valley past the first lake, known as Longpongo at 4690m, where we get chance to observe the Lama footprints on a stone.The second lake, Taboche Tsho mesmerizes us by the shimmering turquoise blue sheet of water sparkling in the sun. Little we reach the third lake, called Dudh Pokhari, linked by a surging stream to the previous one. Gokyo village stands by the third lake and Cho-Oyu Mountain. Above the lake provides panoramic views of Cho Oyu, Gyachung Kang, Lhotse, Makalu, cholatse and Tawache. Stay over night in a tea house lodge. Spend a day in Gokyo strolling around the lakes and hiking up to some of the mountain viewpoints nearby. Start your trek in morning and get to steep climb of about 30min to reach the top with its traditional prayer flags. View the Ngozumpa glacier, the biggest glacier of Nepal. Definitely we would not miss the chance to observe the fourth lake (Thonak Tsho) and fifth lake (Ngozuma Tsho). From where you will have a magnificent view of highest peaks, from the west to east are Cho you (8,153m), Gyachung Kang (7,922m), Everest ( 8848m), Lhotse (8,501m) and further way Makalu. Trek down to Thangnak, enjoying superb view of Gokyo Lake. It can be a break point to Lobuche. The trek to the Cho La pass can be a rather difficult route. But on the way you will be able to experience the best part of your hiking; difficult but very worthy. In good weather you can cross the Cho La with no special equipments but warm clothing and an ice axe might provide added peace to mind. The path skirts around the ridge, staying mostly level. Stop overnight at the village of Dzonglha. The initial step is gentle stroll between snowy peaks that seem almost close enough to touch. The trail runs east past a series of ominous looking black boulders beneath the looking peak of Cholatse. You can turn around to see the Ama Dablam (6856m). About 4 and half hour slowly working takes you Lobuche (4910m). On the way you can see Dughla Lake. Stark and rugged beauty creates almost moonscape campsite at Lobuche a wind swept collection of huts tucked in a narrow meadow between the glacier and the Lobuche peak. Tawoche and Nuptse are particularly spectacularly from Lobuche towering. The first section of the trail from Lobuche follows the narrow gap between the glacial moraine and the mountain walls, past turn off to the Italian pyramid. Take time to detour to the edge of moraine to look over the Khumbu glacier. Along windy and rocky path with the wonderful view of Mt. Pumori, Nuptse and other magnificent peaks, we reach Gorakshep. Gorakshep is the location of the original Everest Base Camp with the new camp being further up the valley. After lunch our adventure continues towards Everest Base Camp. The trail passes through over rocky dunes and moraine and streams. The Base Camp area provides an opportunity to experience the freezing and harsh conditions that mountaineers brave to summit this famous mountain. In Everest Base Camp the climbers gather for summiting Everest during the high expedition season. We explore base camp and its surroundings glacier and return back to Gorakshep. It is around 7-8 hrs trail today. Mornings are usually sparkling and clear and this is the best time to climb the Kalapathar for one of the world’s definitive mountain views. We will be rewarded the 360 degree dramatic panorama views of Mt Everest and surroundings mountains like Mt. Pumori, Mt. Lingtren, Mt. Khumbetse, Mt. Nuptse, Mt. Lhotse, Mt. Ama Dablam, Mt. Thamserku along with many other peaks. You will have an easy walk for about 2hrs back to Lobuche. Today night we will spend here in tented camp. The trail follows an upward path from Pheriche village. It joins the trail below thungla beautiful views of cholatse across the valley. Today’s walk offers views of the Mt.Tawache, Ama Dablam and to the north-Pokalde (5741m), Kongma-tse (5820m) and the great wall of Nuptse. The path follows a pleasant, grassy valley. Dingboche is also the gateway to Chukung and farther beyond for the most challenging traverses towards Makalu area. Today trail gently goes up from Dingboche on wide valley without green tress and forests. We descend a gradual walks up the Imja Khola valley to Chukung, a small summer settlement. We will meet climbing staff for Island Peak climbing. Overnight in Chukung where we make final preparation for Island Peak Climbing. The path from Chukung leads fairly steep way climbing south then turning east to the main line of the valley. It then storms slung or underneath the south side of the valley from the Lhotse Glacier. The trail follows the moraine of the Lhotse glacier to the snout of the Imja glacier where it branches to the east and skirts around the base of Island Peak. Stay overnight at Island peak Base Camp. Today we will move trekking to Island peak high camp. The path leads up beyond base camp for several hundred meters before striking off left up the steep hillside. As you climb the hill, you will see that the slope narrows and the path enter a steep rock channel, from here,The route then follows a ridgeline, which leads to an exhilarating and exposed traverse onto the snout of the summit glacier. 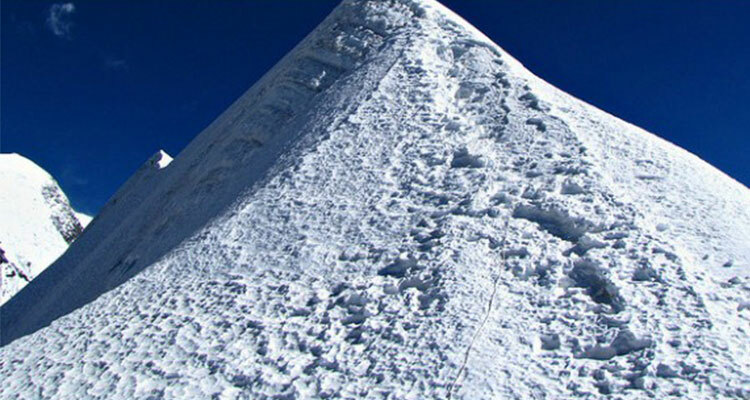 A 60 meters high wall is the only difficulty on the expedition and a final ridge leads to the summit of Island Peak. The ridge is a classic and leads quickly to the east up to the main summit at 6189m. From the summit there are fantastic views across to Lhotse to the north, the Amphu Lapcha and Mera Peak to the south, and Ama Dablam to the west. After congratulations and photos we then head back to Base camp. We will have a long day journey back to Chukung and to Tengboche. We will catch some missing views of Everest range while return path working. Descend out of the alpine dessert and back into landscapes of pine forests. Walk down to the valley from where the trail is shallower through alpine meadows. The path leads to a steep uphill climb into Tengboche. 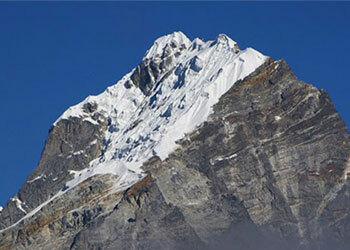 Tengboche offers splendid views of Mt. Amadablam, lush green hills and river views. After crossing the suspension bridge over the Dudh Koshi River trek onwards to the Kyanjuma the junction of the trinity ways to Gokyo Valley, Khumjung village and Namche Bazzar. Dense wildlife of some species of Pheasants, Himalayan Griffons, Musk deer and wild goat can be found abundance inside the rhododendron forest. Evening explore small surrounding area with magnificent scenery. The descent from Namche to the Dudh koshi can be the hardest stage of the entire trek. The trail descends over the ridge past rocky cliffs and scattered pines to the tiny village of Toktok. We will work though rhododendron and pine forests with the view of distance snow covered peak before arriving Phakding. It will be just be another 3hr easy and gentle trail back to Lukla. The trail drops steeply and runs level through out the day. Enjoying the lush green scenery around and passing through the incredible mountain scenery and local Sherpa village arrival in Lukla. You’ll have time to stroll around the local areas. Saying final goodbye to our porters, we will have a flight back to ktm of an exciting one hour. (It also can be a spare day in case of bad weather in Lukla which makes the Lukla flight delayed and cancel.) At the evening you can have your last night in Nepal enjoying the Nepali cultural dinner show exchanging greetings among friends and with all Nepalese people. You can buy some souvenirs. Day 22: - Kathmandu Free day and this is weather day also, Evening join Nepali cultural dinner show. Today is free day for you in Kathmandu, this is wise to make this day as some time Lukla fight may get canceled or delayed so this is spare day for bad weather, you can spend you time for shopping at the Thamel streets or have a rest time in your hotel, evening we will take you for Nepali cultural dinner show at typical Nepali restaurant. Today is free or last minute you have few hour special shopping for your relatives. If you have more time you can do some shopping or sightseeing. We will drop you to the International airport to catch your flight back to your home and wish for your Safe journey. Government license holder experienced, trekking/peak climbing guide (trained in Wilderness First Aid & altitude sickness) Cook, Sherpa, and Supporting Staffs with their food, accommodation, salary, equipment, and accidental insurance, clothing and medicine. All meals during trekking/peak climbing 3 meals a day (Breakfasts, Lunches and Dinners, Tea and coffee). All necessary camping gears like two men tent, kitchen tent, kitchen equipment, mattress while climbing period. All necessary paper works and national park entry permits. Climbing equipment like ice axe, Ice crew, snow bar, climbing rope. Above the Himalaya duffel bag. ( If you need, please let us know before you book the trip and remind us in our pre- meeting at our office). There is no fixed departure trip for this month. You can request for a private group trip. Meet Mr. Puru Timalsena Nepal best trek and tour organizer has been working in the Himalayas more than 15 years, Puru had lead the trips to most part of Nepal, Ti bet, Bhutan and India. Copyright © 2008 - 2018. All right reserved to Above the Himalaya Trekking Pvt. Ltd.